Beau is my daughters mixed yellow lab. A gentle and loving dog. 9X12 oil on linen panel. The eyes being darker draw your eyes in to look at that area first,then you are allowed to scan the rest of the painting. I could have done a better job of blending in the right(left in painting) ear to the head area. It now appears to me that it just sits there instead of being attached. Hey, I saw this earlier and thought I had posted it. May have been a late night entry that I hit the wrong button on. glad you re-posted. Will probably move it to the portraits area soon, but for now, will post it up to the site. The eyes and the fur are well done. A very believable portrait of your yellow lab. If you have more in the line of pet portraits, post them and I'll combine them here! Cat Art, Apollo-handsome oriental cat. 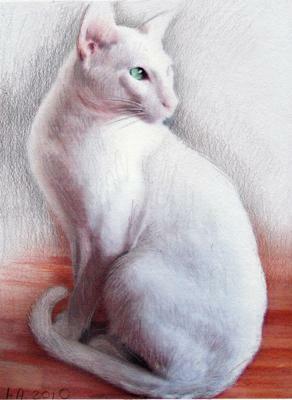 I created this portrait of Apollo my friends white oriental cat, using Prisma Coloured Pencils, on watercolour paper. The photo was just normal size photo. 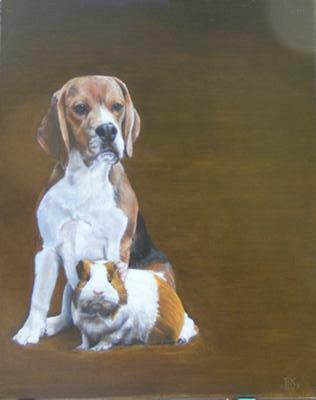 I love portraiture, both human and animal kind, I especially like to draw and paint cats.. I am at present painting animal portraits for friends and on commission, but first I always create for myself as I need to be creative almost daily..
maybe I see myself as next cat-man Drew.. He of the famous and lovely Cat art.. I also like to use other mediums to craete art, I am teaching myself how to use tablet and my corel painter, not as easy as i first thought.. Thank you all for looking at this artwork..
What a wonderful work! Fur is such a difficult item to depict, yet you have made this appear like I can just reach out and feel the soft texture of this kitty. Cat art is also a wonderful niche. Cat's have been with us for so long, and even worshiped in earlier history. Your command of colored pencil is well presented here. Keep up the great work! Comments for Cat Art, Apollo-handsome oriental cat. beuatiful painting! the effect of the shadows and the fur is excellent! 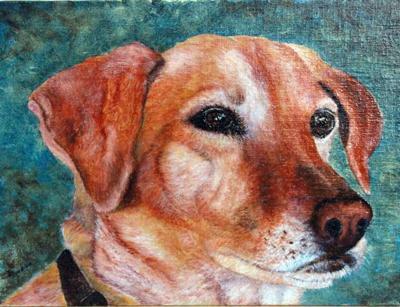 Charlie is a hunting dog - I was commissioned to paint him for his owner. I don't sketch - I just sit and paint. Oil on canvas. 12x16"
Alan, thank-you for the submission! I hope you don't mind that I rotated the picture for you. Spike was laying on his side when I first viewed this, and, well, the gerbil(hamster) just didn't like being on the bottom! It is a beautiful piece of art and I know the owner is proud to show it. Thanks again for the contribution! Monty, an oil painting portrait. 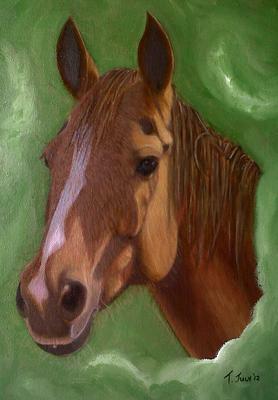 Jules, a chestnut colored horse portrait, oil painting. 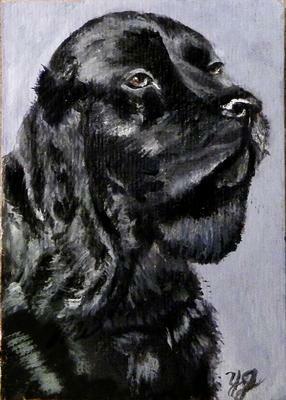 Since I painted Fynn in mid June 2012, I have been painting animal protraits. I am learning so much. Judge is a living Rottie, a friends dog and a challenge! Who knew that black fur is not actually black? Monty died in 2009, and his owner is still grieving. she has recieved a lot of healing from my painting on him. he was 15 years old when he passed. Jules is a chestnut horse with an attitude! She died in 2009 as well. My painting of her is currently drying and waiting to be framed and sent to Cape Town to her owner. I am really enjoying painting, and my dappling has inspired a few people to try oils or start their artwork again, so I am pleased. Again, thank you for your website. Some more fantastic work! thanks for submitting. 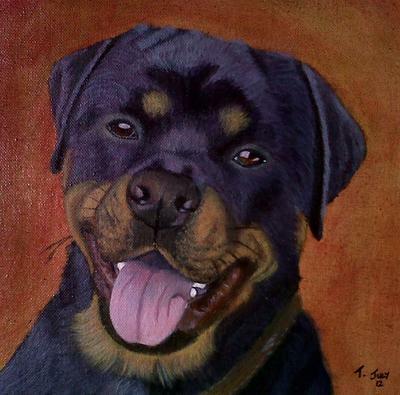 I especially like the Rottie portrait, He's seems to be just hamming it up and smiling at us. You seem to have mastered pet portraits well. These works look like they are done using a more direct method. Hopefully, you can fill us in on how you've accomplished these. The fur if so realistic! Very inspiring to see these paintings of animals...as i too am ​a fan of painting animals... i would Love to find out how much you charge for your animal portraits? 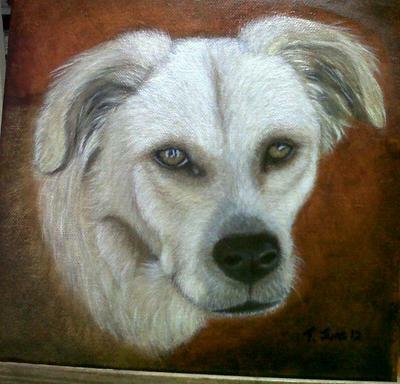 Fynn, an oil painting portrait of a rescue dog. Hi everyone, I have been painting since June 2012 - I have had no training, so I know I have made a million mistakes. My need to paint Fynn was so strong. He was a rescue dog, and I loved him very deeply. He died suddenly on 31st May 2012 - of probably Leukemia - we are not sure but it was bone marrow related. he wasnt 3 years old yet. 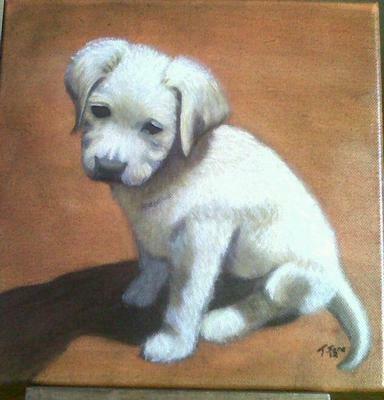 It was through deep grief that I painted 2 pictures of him - as a 7 week old puppy and it was the first time I saw him when I fell I love with him, and the second one was from a photo I took of him a month before he died. I painted him 2 weeks after he died. I arrived at a friends house with a canvas and some oils and said "right, I am ready, what do I do?" Fynn popped onto the canvas in a week for each painting. Thanks Tracy for showing us this wonderful piece and the story behind it. The painting are very well done. I'm sure Flyn lived a happy life in your home as it is evident in the care you've put into these paintings. I know they will help you in the healing process and hopefully will bring you fond and happy memories of the antics these little pups can get into. Best wishes in your future painting endeavours, and do continue to post them here. Folks enjoy learning a little about the painting and the artist. 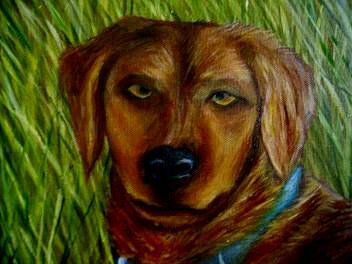 Comments for Fynn, an oil painting portrait of a rescue dog. The face on this Cocker Spaniel so gentle yet so regal was the inspiration behind my painting. I paint in miniature and this one was painted in Acrylics on Canson-Canvas paper 2.5 x 3.5 inches. I find it a challenge to paint in small format with all of the details that you would put into a larger painting. I have painted in larger format but their is something magical that happens when you hold a miniature in the palm of your hand. 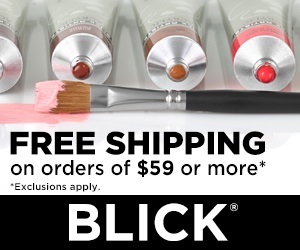 This site has also been an inspiration for me since I am a self taught artist. 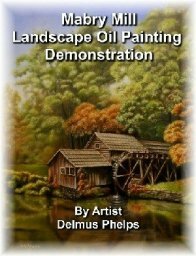 I have learned a lot for all the teaching on easy-oil-painting-techniques.org. I've even learned to paint in oils though I prefer Acrylics. 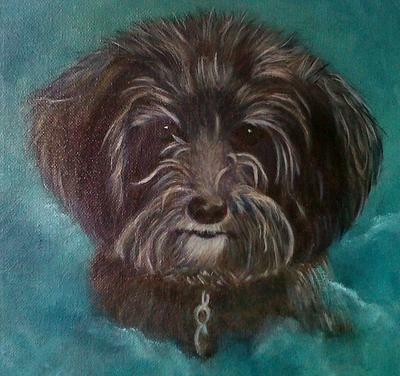 another great painting, yes, you've captured the essence of this dogs inner spirit. I have a Cocker, (chocolate in color) and she is very regal, and very inquisitive. Always getting into trouble, but she is our darling. thanks for posting this beautiful example.